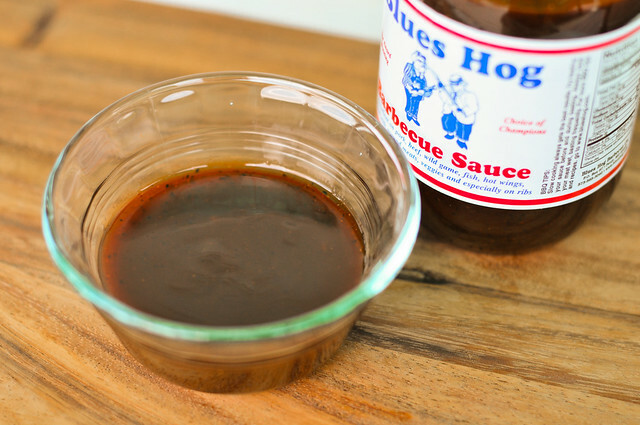 A sauce clearly designed with competition in mind, Blues Hog's syrupy texture and heavy-handed flavors adds a glisten and a ton of taste to meat. The only problem, this isn't always the best thing for the home griller. Having seen Blues Hog abound at barbecue competitions, I've been itching to give it a try myself. 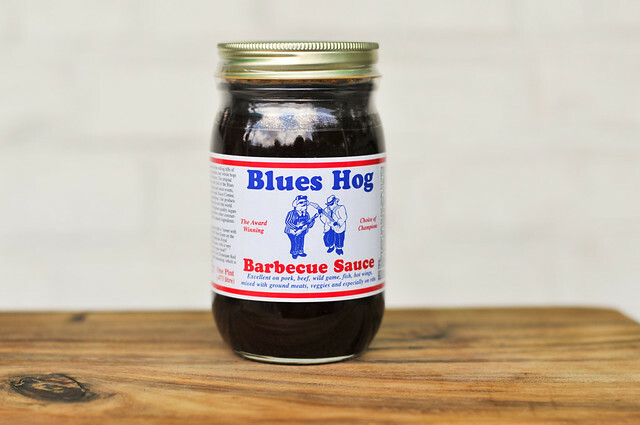 The sauce originate in the hills of Tennessee by Bill Arnold, pitmaster of the award-winning Blues Hog Cookers. His focus was to create a unique sauce made of high quality sugars and spices to set it apart from others. Blues Hog barbecue sauce went on to win awards as "Best Baste on the Planet," and People's Choice at the American Royal. One smell of this sauce and there's no doubt there's a lot of sugar in there—the first ingredient is brown sugar and that doesn't lie. There's also a strong vinegar note that tingles the nose along with a complexity from Worcestershire and faint black pepper. The deep maroon sauce weighs in on the heavier side of medium. Although dark in color, it's not opaque and you can clearly see a lot of spice specks—most distinct being black pepper and red pepper flakes—throughout. It's a syrupy sauce that slowly flows in a smooth stream of a suspended spoon. Despite a strong sugar smell, the sweetness is fleeting as the first hit of sugar is quickly overtaken by a mix of heat from black and red pepper, among other spices. There's a strong vinegar tartness throughout the entire thing. The sauce has a thick, syrupy fell that coats the tongue and leaves the flavors of this sauce lingering. While the flavors are all pretty strong, they stay in a nice balance between heat, sweet, and tang. Liking the flavor out of the jar, I had high hopes for using this as a baste, but it didn't quite hold up on the grill. The syrupy sauce did coat the chicken well each time it was applied, but it didn't stick throughout the cook and didn't bake into the chicken much. In the end it needed a final brush of sauce because the coat was so thin. The grilling did bring a bit more sugar out in the sauce, and paired against the strong heat, there was a little bit of a better balance to this super sticky sauce. For all the love I've seen for this sauce, I thought I may have found my first 10, but some shortcoming dropped Blues Hog a few notches lower than what I expected. First is a matter of personal taste, but I wasn't the biggest fan of the syrupy feel. Second, it delivered great on flavor, but not on grilling. 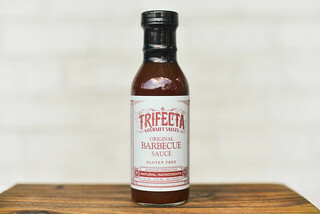 The same reasons I didn't find this to be the top sauce for the home griller are the exact reasons it's so cherished in competitions. The syrupy feels also creates a shine that makes meat glisten, giving an extra glow in presentation for the judges. Then the heavy-handed flavors, which may be a bit overpowering at times, also ensure that each piece of meat is packed with taste—a must when one bite by a judge may be all you get. 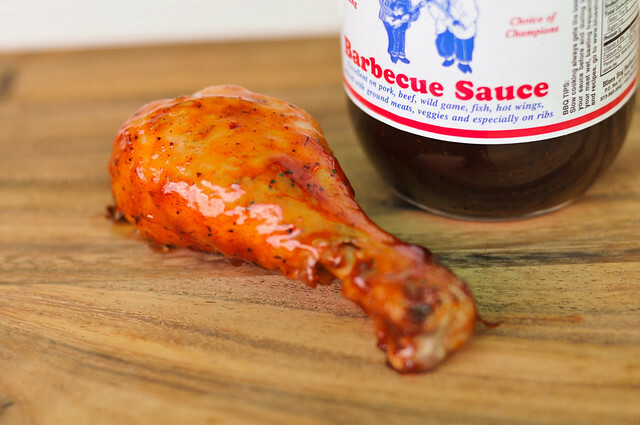 So for competition, I can see this probably as a 10, but at home, this isn't the best sauce for use on grill, but its nice balance of strong flavors will surely work great as dip or condiment. You think it is thick out of the jar, just wait until you take it out of the fridge to use. It comes out as easily mixed cement, ha ha. This is my families favorite sauce but it is way too sweet for me. I like to mix it 50/50 with their Tennessee Red sauce. 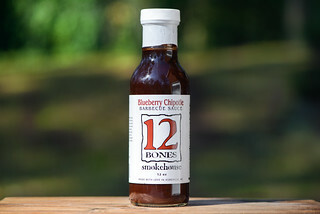 Tried this sauce this weekend on some smoked baby backs, wow, it was nice. Very rich, does not take much, has a kick after the sweetness leaves as stated. 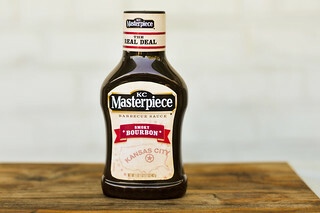 It's almost "not" a BBQ sauce - kinda like a hybrid or something - very different, very good.